People who played Albert Einstein in a virtual reality game actually experienced a change in the way they think and choices they made - with some even reaching a higher IQ, a new study has shown. “Virtual reality can create the illusion of a virtual body to substitute your own, which is called virtual embodiment,"said Professor Mel Slater of the University of Barcelona. Previous research by Slater and his associates had suggested that the virtual embodiment of someone else can have a significant impact on attitudes and behavior. A study published in the journal ‘Frontiers in Psychology’ in June found participants with low self-esteem scored better in IQ tests when they virtually stepped into the genius’ body. The researchers were keen to take the virtual experiment to the next level, and wondered if the immersive experience could alter cognitive ability. 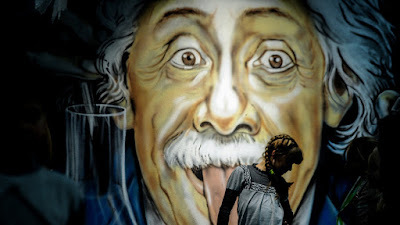 “If we gave someone a recognizable body that represents supreme intelligence, such as that of Albert Einstein, would they perform better on a cognitive task than people given a normal body?” Slater wrote about the inspiration for the new study. Some 30 young men took part in the experiment. Prior to the VR experience, each man completed three tests to measure their cognitive ability, self-esteem, and bias towards older people. The participants then dressed in a full-body suit and VR headset to embody Einstein. The study found people with low self-esteem performed better in their follow-up cognitive exam, and all had a reduced bias against older people. The researchers behind the study hope the results can be utilized to better serve students. Especially those with low self-esteem who, they say, have the most to gain by changing how they think about themselves.